Gibraltar is a welcome home from home for any UK epxat or traveller and a “little slice of England” for anyone coming from further afield. It offers UK high-street shops as well as smaller boutiques, perfumeries, IT and gadget shops and a range of delights for any keen shopper. For anyone wanting more than shops, the Gibraltar Museum is a treat – filled to the brim with artefacts, models, displays and even the odd Mummie or two! There’s also plenty to keep you entertained including an ice skating rink, two cinemas screens, ten pin bowling lanes, an amusement arcade, restaurants and bars and a gym all housed in King’s Bastion Leisure Centre, a lovingly restored military fortress that was once used to defend Gibraltar against invading forces during the 18th century. For worship, tranquillity or reflectiveness, visit Kings Chapel, St Andrews Church, Holy Trinity Cathedral, The Great Synagogue and the Flemish Synagogue or Catholic Cathedral of St Mary the Crowned. Gibraltar is steeped in history, culture and diversity – did you know the skull of a Neanderthal woman was discovered here in 1848 and was only the second Neanderthal skull ever found and the first adult Neanderthal skull to be discovered, eight years before the discovery of the skull for which the species was named in Neanderthal! 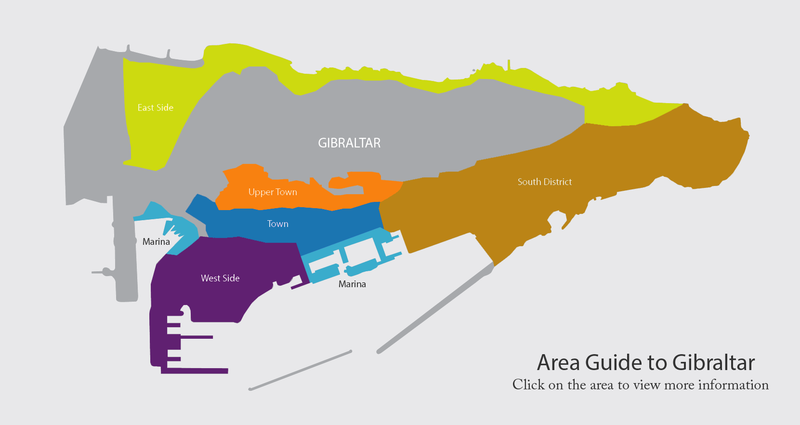 The upper town offers a treat for anyone wanting to learn more about Gibraltar’s history or just explore the Rock. Including St Michael’s Cave, the Moorish Castle, the Great Siege Tunnels & WWII tunnels, Princess Caroline’s Battery and, of course, not forgetting the Apes Den. The Ocean Village marinas have become Gibraltar’s prime destination for yachts and super yachts, and boasts a large range of restaurants. Very close to the city centre, Ocean Village is a great place for entertainment and living. The Ocean Village developments have access to the most impressive pools and jacuzzis in Gibraltar, plus a great casino and Gibraltar’s only 5 Star hotel, the Sunborn.